300+ General Knowledge PDF Provided here. General Knowledge is very important for Competitive Exam. If you want to prepare for WBCS, PSC Food SI Exam, then you need to some good study materials for practice. We regular update various GK PDF book for you. 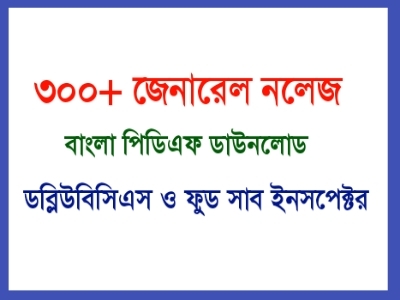 Today GK Solve share 300+ General Knowledge Bengali PDF Download link. Its very helpful to WBCS and PSC Food Sub Inspector Exam. Details of 300+ General knowledge Bengali PDF book and download link are given below.